World Amateur Muay Thai Association of Canada (WAMTAC) is moving forward with the first event under their independent sanction. 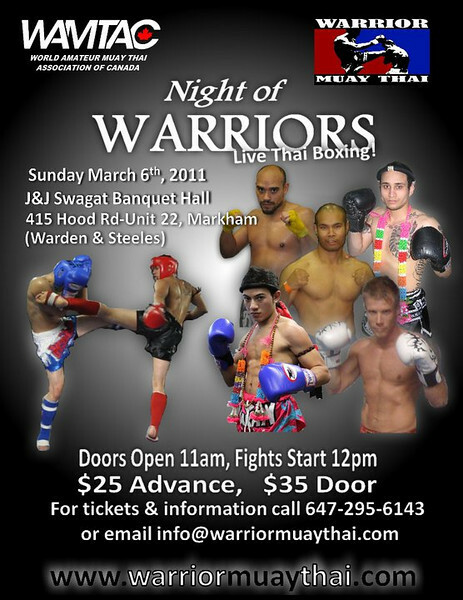 Prior to this event WAMTAC hosted nearly the first Muay Thai event held in Toronto in nearly 2 years. There have been some legal wrangling on the part of Robin Finley of CMTC-A and some active efforts to stop their progress but WAMTAC thus far is making Muay Thai a regularly occurring event in Toronto, Ontario. Make note specifically about what Finley says in regards to the National Federation requirement in the comments section. Though largely most fighters in Ontario are going to remain the perpetual away team in order to compete it’s a good sign that amateur fighters at least now have a place to get valuable experience. As a matter of demographics Ontario is the biggest province population wise in all of Canada. Compared to the province of Alberta (Where CMTC-A is headquartered) amounting to less than 1/3 of the size of Ontario at 4 million. ~ by fatsoking on February 7, 2011. Don’t know how gyms like Siam No. 1 and Krudar weren’t approached to take part in this event, thats blasphemy! They were approached but to put it succinctly Khan and Suchart don’t like each other. And Suchart would prefer to follow the Mike Miles model. Talking without knowing is a lot closer to blasphemy. KDM – Thank you for raising this very important misconception. Firstly, let it be said that both Krudar and Siam No. 1 undeniably 2 of the most prominent, influential and important contributors to Muay Thai in Ontario and perhaps Canada at large. Both of them deserve recognition for their dedication to the sport. The below comments are in no way meant to offend anyone affiliated with these 2 camps. WAMTAC has a public application process outlined on its website. All gyms are free to apply and unfortunately the gyms listed above have not yet. Further, with all due respect Ajarn Suchart of Siam No. 1 previously expressed via email his disapproval of WAMTAC and support of CMTC-A’s efforts to establish another Provincial Sports Organzation in Ontario, which has beek spoken about for nearly 2 years since CMTC-A refused to recognize the previous PSO (CAMTAO) and it was dissolved. There are several other gyms that have in fact openly declined participating in WAMTAC as they are worried about severing their relationship with Siam No.1. So apologies for not openly inviting them – but WAMTAC would love to see these gyms express their interest in participating and showcase the skill of ther athletes to the public. It is unfortunately a politically sensitive issue, but WAMTAC is completely open very hopeful that these and other gyms will apply and participate for the benefit of the sport. This event is in part an effort to quell the fears of all the other gyms out there who have been fed misleading information about WAMTAC, to inspire them to reconsider their positions and to join. Recently, its efforts are gradually shifting to a 3rd phase: Promoting itself to gyms across Canada and in particularly in Ontario who have suffered a nearly 2-year absence of such events. The fight roster for this event is not finalized yet and there is certainly room for more athletes to be added. Any gym with athletes interested in competing on this card may contact the event organizer listed on the poster to discuss the process.